Slough has historically suffered from a reputation as an undesirable place to live and do business, but a new campaign created by digital communications agency E-creation for Slough Borough Council is revitalising Slough's image to reflect the vibrant activities, culture & business happening in the town. Slough Borough Council commissioned E-creation, the award winning Bournemouth based digital marketing and communications agency, to develop a campaign across the digital and traditional channels. At the heart of the campaign is an online events directory that is part of the government's “e-directive”. E-creation was brought in to 'jazz communications up' after the initial site implemented did not achieve the results expected. E-creation introduced urban, contemporary design and functionality in the form of a new logo, directory website, marketing materials for schools, digital adverts and social media marketing. E-creation started by developing a new brand name and brand mark: SloughForYOUth. 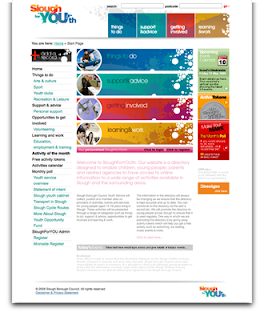 The new domain name, www.sloughforyouth.com, was implemented, the website re-designed from ground up, covering details of thousands of local events and activities for young people. Young people are able to plan their social activities, discover volunteering opportunities and access support and advice. To raise the profile of the website, E-creation created a series of interactive advertisements for schools across Slough, a series of currency tokens that can be exchanged for free activities in Slough such as free swimming and a Flash animation featuring music written by Slough-based rising music star, Josh Cyrus. In addition to focus groups in young people's centres and Slough’s youth cabinet, E-creation used social networking media sites such as Facebook to access instant, valuable feedback from a wide range of young people in Slough. This enabled the agency to capture highly creative ideas for the design & functionality. Notes: E-creation is an award-winning digital marketing agency creating digital business communications using scientific persuasion techniques & research. They offer creative design concepts & graphic design with intelligent functionality in websites, interactive CD-ROMs, digital presentations & online marketing campaigns working with many of the UK’s government organisations, such as the NHS, the Learning & Skills Council, City & Guilds, Transport for London and Slough Borough Council. For more information please contact Jan-Erik Paul using the details below.